The WGSF website has lost most of its links and images. We have retrieved as much as possible of the site and have preserved it here. We wiill continue to attemp to restore the pictures that are missing. We have removed inactive links, and made some minor edits to the site. 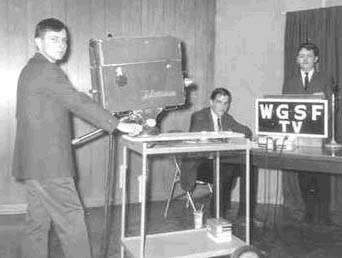 Public Broadcasting Station WGSF Television operated in Newark, Ohio, from 1963 to 1970 as Channel 28, and then as Channel 31 until it ceased operation in 1976. > The story of television broadcasting in Newark, Ohio, has roots that go much deeper than the relatively short life of the WGSF broadcast station itself. It took a lot of work and community cooperation before the first day of broadcasting on Channel 28 began. Many people contributed time, money, and even tangibles over the years in pursuit of a vision that public and educational uses of television were not only a valuable asset, but were also attainable in a local community. WGSF Televison was licensed to the Newark City School System, and was the only PBS station owned and operated by a Board of Education in Ohio. connected with the station, as Administrators, Employees, Student Staff, Volunteers, or Community Support. Please report broken or incorrect links. TThese web pages comprise an on-going endeavor to compile a history of the WGSF Television station, utilizing the internet to store data from the files of the former PBS station, including correspondence, pictures, program schedules, and other memorabilia. Fortunately, many of the documents from WGSF have been retained, along with some items of equipment. I am especially interested in including memories and insights from people who participated in this community television experience. Contributions and comments are welcome. Hopefully, these web pages will develop into a compilation of these resources with memories and insights from people who participated in the community television experience. If you were involved in some way with the TV station , as an Administrator, Employee, Student Staffer, Volunteer, or in the Community Support groups, please Help Preserve the Legacy of WGSF. Check through the topics already started. Encourage others to become involved, and become contributers to this project. 2. Discussion e-mail Listserver - This Listserver is provided for general discussion between List members, including announcements, commentary, and questions. E-mails submitted to the Listserver are distributed to all registered participants via email. E-mail can be distributed to lists of people as well as to individuals. A shared distribution list can be managed by using an e-mail reflector. When you receive an e-mail from the WGSF Discussion List, you will see only your name in the "To:" line, not that of everyone else on the mailing list. You use your current e-mail address to subscribe, and messages will be sent to your regular mail account. You can choose to receive e-mails as they are posted, or as a collection (batched) in one mailing, called a DIGEST. The list server will automatically add your name and distribute future e-mail postings to every subscriber. WGSF BLOG - < Click to go to the blog pages. Blog - A website in which items are posted on a regular basis and displayed in reverse chronological order. The term blog is a shortened form of weblog or web log. A blog comprises text, hypertext, images, and links (to other web pages and to video, audio and other files). Blogs use a conversational style of documentation. Often blogs focus on a particular “area of interest." Blogger -A person who posts these entries is called a “blogger”. Blog posts are 'open' and may be read by anyone visiting the web site. Anyone desiring to become a blogger must register and be approved by the Administrator for the blog. You can, however, submit posts without registering. All posts are edited and 'published' by the Blog Administrator. The WGSF Discussion Listserver replaces the inter-communication/e-mail distribution functions of the Yahoo! site. The Yahoo Groups site will remain available, but as a secondary site only.